Well, Happy New Year! After all the fun and festivities January was a fairly quiet month for us. Euan started back to his swimming lessons and is doing well learning the elements of the different strokes. We haven't managed out for much cycling as the weather has been a bit cold and wet. Euan had to learn a poem in Scots for school. He did very well reciting 'The Heron' by J K Annand but was not one of the prize winners. We headed south to Berwick to visit Auntie Gillian for her birthday. We all enjoyed staying at the Cobbled Yard Hotel, and Euan was very happy chatting up the barmaid!. Wow, what a busy month. It started with Euan going to visit his cousins at the farm for two nights. Whilst he was away Mummy and Daddy decorated his bedroom. When he came back he said it was "Awesome"
The following weekend was busy as well, starting Friday with Mummy taking Shetland Granny for a manicure and lunch. The day was shortened slightly as Euan fell over in the playground and had to come home from school early. Sunday then saw a restart of rugby training for Euan and a trip to the farm for Shetland Granny's birthday party. Daddy and Uncle Richard watched the rugby. We had a bit of a rest next weekend, only going out for lunch after the rugby training. Half term saw us going to London, on the train. Daddy manged 77 hours without driving! Oyster cards are brilliant, we travelled on the underground, overground, Docklands light railway, buses and boats all on the oyster card. We visited the science museum and Borough market and then popped out to Romford to visit uncle Bob and Auntie Irene. We are very grateful to Chris and Sarah for the use of their flat, they went off skiing at 4:30 Saturday morning and didn't throw us out. We had an unexpected visitor at the beginning of March. Jolly the giraffe came home from school for the weekend! Once we got him settled in we decided that he might enjoy a trip to the Farmers Market in Perth. He declined any of Euans buffalo burger being strictly vegetarian. He also accompanied Euan to rugby practice on the Sunday but didn't take part. Euan had his swimming assessment at the beginning of the month and continues to progress well. He is very adept at swimming backstroke but crawl and breast stroke need a bit more practice. The 8th of March was world book day and Euan chose to dress up as Streaker the Dog as his favourite book character. Mummy had great fun making his costume and even the face painting went well! The following week at school Euan had the opportunity to meet Chae Strathie, a childrens book author and was delighted to have his copy of Jumblebum autographed. The other school event this month was parents night...good report! Mummy has started going to the Carse Crafters on a Wednesday night and has learned how to make decorative boxes and a refresher course in crochet! Euan comes along and enjoys chatting to the other members as well as eating the chocolate biscuits on offer! We nipped across to Anstruther on Sunday afternoon for high tea. Although the sun was shining it was bitterly cold so we didn't do much exploring. We had built up an appetite though and it didn't take Euan long to consume his enormous fish! Daddy was off on a training day at the end of the month so Mummy and Euan took the opportunity to nip into Dundee. We did a little shopping and went for lunch at a new tapas restauarant which has recently opened. Euan's comment was 'it's not Spanish it's just like a Scottish cafe' I have to admit he did have a point there! What a fun packed month April has been. Euan had two weeks and two days off for school holidays. The first week he attended Errol Childrens Club. The highlight of this was a visit to the local crisp factory. This was great fun with lots of opportunity to sample the products and there was the added bonus of a goody bag full of tasty treats to bring home. The following week Euan spent with childminder Karen, where he had great fun and loved his role as the responsible 'big boy' in the group. Euan and Mummy took a trip to Edinburgh on the train where we met up with Rosie. Our trip to see the Woolly Mammoth exhibition at the Museum of Scotland was slightly shorter than we had hoped due to industrial action by the staff. However, after a scrummy lunch we had a very entertaining time wandering round Greyfriars graveyard. Euan posed for a photograph with the statue of Greyfriars Bobby and was amused that this is the same type of dog as Mummy was named after! We had planned to go camping at Aviemore over Easter and were hoping for good weather. Surprisingly this is what we got! Lovely warm sunny days although the nights were quite chilly. On Good Friday we had luch on the steam train which was delightful, then it was back to Loch Morlich for a bit of canoeing to burn off some calories. Unfortunately the car was poorly, so Saturday involved a trip to Inverness to leave the car at the garage to be fixed. On Easter Sunday we cycled to Loch An Eilan where Euan joined in the Easter Egg Hunt. We then cycled back to the campsite stopping for a picnic lunch on the way. On Easter Monday, Mummy and Euan travelled home on the train whilst Daddy was dispatched to Inverness to retrive the car! The good weather this month has meant that the garden has had a little tidy up and we have managed to get some crops planted. Euan is still going to rugby training on Sunday mornings and did so well recently that he received a medal for his efforts. We had visitors this month too!! Grandad and Flora arrived.....unfortunately their luggage didn't. They we reunited with it 24 hours later and were able to be off on their travels in the UK. We hope to meet up with them again sometime next month. What a lot happened in May! Daddy and Euan went off camping in Northumberland unsupervised on the Bank Holiday weekend! They had a great time, managing to fit in some canoeing on the River Till, a bit of bouldering at Bowden Doors,and a visit to see Auntie Gillian! The only disappointment was missing out on dinner at the pub .... back to the chip shop again! Meanwhile, Mummy enjoyed a little peace and quiet back home...well in the Phoenix in Dundee with a few friends!! Rugby training has finished for the summer however Euan was delighted to be awarded the trophy for Most Improvement in the Primary 2 group. Mummy and Euan took part in the Errol Parish Bake Off. Euan made a Gruffalo crumble which was awarded joint 3rd prize in the childrens entries and Mummy had a 1st prize for her lof of bread. We were both rather chuffed with our certificates and rosettes. We all took the opportunity of enjoying the warm spring weather by heading off to Tentsmuir forest one Sunday. I'm not sure what distance we cycled but everyone was exhausted that night!! We have also managed to get out into the garden quite a bit this month. The vegetable patch is all planted and everything is looking quite healthy. The wall round the patio has finally been constructed - looks great! We've also done some work round the pond - hopefully the resident frogs haaven't been to perturbed by this! We had a little trip to see the new Dundee Museum of Transport. Euan enjoyed doing the quiz as we went round looking at the exhibits. We're now halfway through the year and Euan has finished Primary 2. His school report was excellent and we are very pleased with his progress. Here's hoping he continues to do well when he starts back in August. The schools sports day was very sunny and although Euan didn't win any races he had fun and came home quite pink! Euan and Mummy had a fun packed weekend at the farm this month too. It started with a ceilidh on the Friday night. 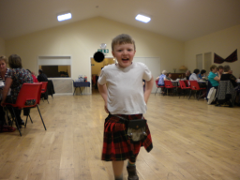 As usual, Euan had his kilt on and was up dancing for most of the evening. Even cousin Angus was up dancing too! On the Saturday we headed off to the Royal Highland Show and had a fabulous time. On the Saturday night, Mummy got dressed up for a school reunion. Euan said that she was beautiful ...what a little charmer!! Sunday was Olivers 6th birthday - his minion cake looked great and tasted super too! Daddy took a day off at the end of the month and we all headed off for some camping near Aberfoyle. The midgies really liked Euan - a total of 51 bites at the last count. We cycled a total of 15 miles on the Saturday - we were all very hungry that night. The rangers at the campsite had some activites available for children so Euan too part in the mini raft build/race and the magic wand making workshop. I've tried the 'win the lottery' spell but I must be doing something wrong as I've had no success yet! The school holidays are in full swing! Euan spent three weeks at Errol Childrens Club doing a range of activities. One of his favourite things was the cafe - Daddy managed to attend and have some coffee and cake. Euan's 'waiting on' skills were put to good use. The children also went to the McManus Museum and Transport Museum in Dundee and a bonus visit to Camperdown Park since it was such lovely weather. The trip to Muddy Boots farm park was a little rainy but the children all had fun regardless! In the middle of the month, Mummy and Euan abandoned Daddy and headed north to Shetland. We flew up from Aberdeen and were met at Sumburgh Airport by Auntie Rosemary and Uncle Brodie who were also up visiting. The weather was lovely most of the time although some days were quite foggy to begin with. Shetland Granny had a few chores for Euan to do and he was delighted to be paid for carrying them out. We managed a couple of trips to the beach so Euan has had a paddle in both the North Sea and Atlantic Ocean! We paid a visit to the newly refurbished Sumburgh Lighthouse which was very interesting - Euan particularly enjoyed pressing the button to sound the foghorn on display! We saw many puffins on our trip to the lighthouse - they were only a few feet from the path and completely unconcerned with everyone taking their photographs! We travelled back down on the boat - it was a little bumpy part of the way but we both slept quite well and were in plenty time to catch the train back to Dundee. Although Daddy had enjoyed the peace and quiet for 10 days I think he was pleased to see us back. Still in the middle of the summer holidays at the beginning of August, so Euan spent a week with Karen whilst Mummy went back to work. Euan enjoyed being the 'big boy' in the group of children Karen was minding but was very confused trying to work out how Mummy was related to Baby Jack - he's Mummys cousins daughters son! Daddy took a week off work and had planned a two day camping trip to Glen Elg with Euan. Unfortunately the weather had other plans, so the tail end of a hurricaine meant they returned 24 hours later very soggy! They did eventually dry out and we all went off for a few nights camping at Loch Tummel. As a treat we took the train up to Aviemore to visit the Highland Wildlife Park. It was very interesting seeing all the different animals but our favourite was the Scottish wildcat family. We were starvng by the time we arrived back in Pitlochry but we beat the hoards of tourists to a table in the fish and chip shop and enjoyed a great meal and entertainment provided by the chap behind the counter... On the Sunday, (after a trip into Perth for the start of this seasons rugby training) we headed across to Crieff for Mummys birthday treat - a distillery tour and chocolate tasting at the Famous Grouse Experience. It was exceptionally enjoyable! hic!! We had Errol Show at the end of the month. Mummy had a successful day - winning the baking shield and Euan also won first prize for his sheep crispy cakes and a second prize for his miniature garden. September was full of rugby and food. It started at the Food and Flower festival, where Euan got first prize for his decorated flowerpot, called Hamish the Hairy Highlander. Daddy got a third for his girdle scones but poor Mummy got nothing for her Dundee cake. Mummy and Euan got to Doors Open day in Dundee,this include D'Arcy zoological museum, Blackness road fire station and dundee dental hospital. This persuaded Euan to be a dentist after working on a phantom head! Rugby training started with a visit from Chris Paterson and Andy Nichol to help out with the training. The following week rugby tournaments started with a visit to St Andrews, 3 games of touch rugby were played, 8 minutes each way with 2 minutes half time. Euan enjoyed this and his continued attendance was guaranteed by a free hot dog at the end. The following weekend was exceptionally busy - doors open day in Perth - visit to the farm and a rugby tournament. Mummy and Euan visited Perth museum for a behind the scenes tour, then Daddy picked them up and we went to the farm. Mummy and Daddy went to the pictures to see "Before I go to sleep" a book they had both read. Euan really enjoyed his visit. On Sunday morning we went straight to rugby, another 3 games followed by another hot dog! The month ended with Euan having two days off school, inset days, so he got two days at Errol childrens club. The last weekend was spent washing cars, cutting the grass and painting the fence. Rugby was standard training in Perth, followed by a ............ hot dog! The month started with Daddy's birthday and so Mummy invited the farm to dinner to celebrate. We were rewarded with a full attendance, including Kate. Euan was very entertaining and everyone enjoyed the "Penguin pile up" game. We then went off on our holidays details here. Once back from our holidays Euan still had another week off school and went to Karen's for four days. We think he enjoyed it, he was generally too exhausted to tell us much about his day. The month wound up with a rugby tournament at Cupar. Euan made a couple of excellent defensive tackles. The coaches noticed and praised him, add this to a sausage roll carton of juice and choclate biscuit, he enjoys the rugby! Euans birthday month - he is now 7 years old! Where have those years gone? He loved his cat cake and received many great presents. His train set is certainly expanding. At school Euan has been enjoying his woodland topic. This has included some outdoor learning in the local woods, creating an informative leaflet about roe deer and taking part in a special assembly. Daddy went along to watch the assembly to see Euan dressed as a deer (Euan's costume involved wearing Mummys brown jumper). It was also parents night this month. Mummy attended to find out that Euan is doing very well in P2/3. I think Miss Annand is very happy to have Euan in her class. We had Shetland Granny to stay for a couple of days which was nice, as were the four rounds of homemade shortbread she brought with her. We had a trip out to Comrie on Sunday after rugby training to visit Auchingarrich Animal Park. It was really enjoyable with plenty of furry and feathery things to see .. and a good cafe as well! Here we are at the last month of 2014 with lots of things going on! At the beginning of the month was the school christmas fayre which Mummy and Euan helped out at. It was a very successful day with over £1500 raised for school funds. Other festive school activities included a christmas party christmas jumper day (Euan went with jingle bells attached) and the annual trip to the pantomime in Perth. Mummy took the opportunity to take a week off work before she started her new job. She didn't do anything very exciting but did manage a train trip up to Inverurie to see John, Jennifer, John and Diane... and to do a tour of the towns supermarkets!! We had a lovely Christmas day - managing a trip down to the farm for some mulled wine and more present opening before heading home for a late lunch. On Monday 29th, a very frosty sunny day, we headed down to Berwick to see Auntie Gillian. We had a lovely lunch and also went to check out the accommodation for our visit there in February. We saw the New Year in down at Cardenden. It was a lovely evening with Brodie and Rosemary - plenty of dancing and party games for Euan to take part in! Copyright © 2014 Jolly John. All Rights Reserved. Designed by John Steven.